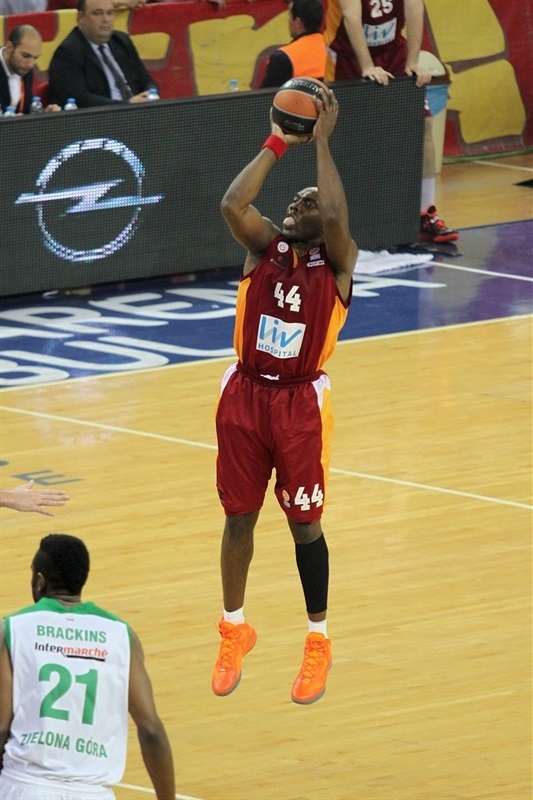 Galatasaray Liv Hospital clinched second place in Group C with a 76-57 rout of Stelmet Zielona Gora on Friday at Abdi Ipekci Arena in Istanbul. The Turkish champs improved to 6-3 with the victory. The result also dropped Zielona Gora to 2-7 and eliminated the club from Top 16 contention. The Polish champs will continue their European campaign in the Last 32 stage of the Eurocup. Galatasaray’s three big men did most of the damage for the hosts, who built a double-digit lead in the second quarter and cruised the rest of the way. Zoran Erceg led all scorers with 19 points, Milan Macvan added 18 and Furkan Aldemir tallied 11 points and 16 rebounds for the winners. 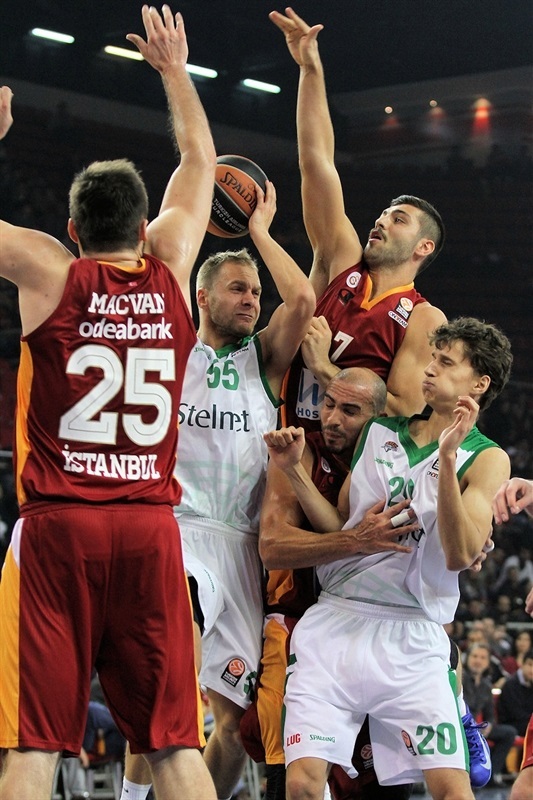 Carlos Arroyo powered the Galatasaray attack with 7 assists. Vladimir Dragicevic posted 11 points and 7 rebounds and Lukasz Koszarek finished with 11 points and 4 assists in defeat. After a scoreless opening minute, Henry Domercant opened the scoring with a three. Dragicevic asserted himself as the Polish champs’ go-to guy. He scored on three possessions and assisted Aaron Cel in between in giving the visitors a 5-7 lead. Cel scored again before a Dragicevic jumper put the visitors up 6. Cenk Akyol came up big with a three from the win for the home team. Macvan battled on the offensive glass and Aldemir scored in the paint to put the hosts up 12-11. 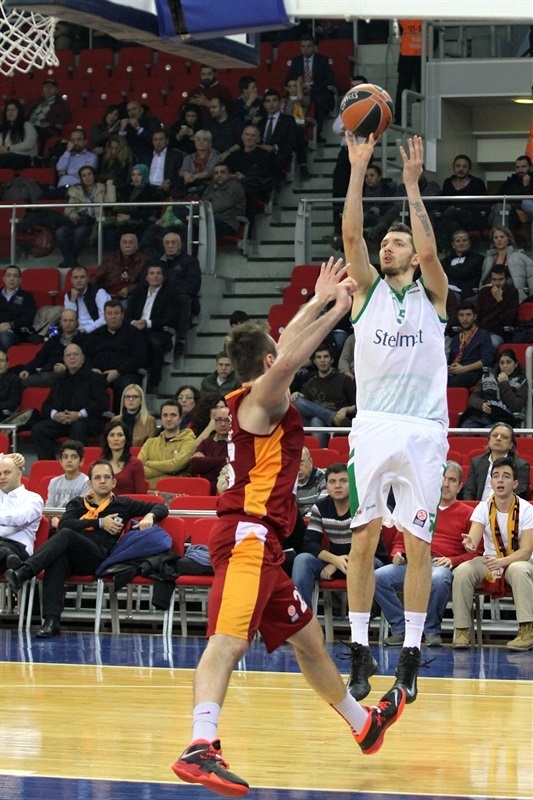 After Dragicevic scored his 9th point and Aldemir split free throws, the score was tied. Akyol’s second triple was followed by another Dragicevic bucket. 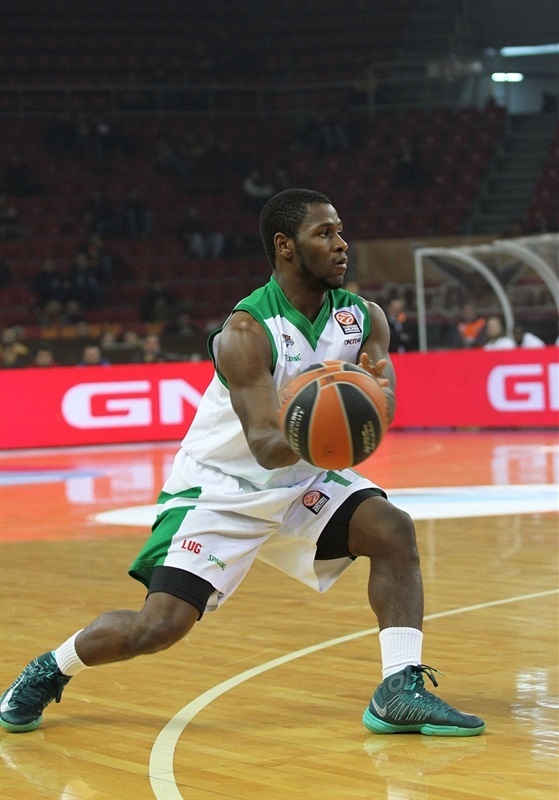 Macvan remained a force on the glass as scored again after an Akyol miss. Arroyo played the pick-and-roll perfectly with Aldemir, resulting in a slam for the latter and a 20-15 Galatasaray lead through 10 minutes. Macvan added another basket in the paint before netting a pair of free throws. The big man then went to work on the other end where he rejected Dragicevic, but then committed a foul trying to stop Adam Hrycaniuk. But the Zielona Gora center missed the free throws. Domercant gave the hosts their first double-digit lead, 26-15. Koszarek and Domercant traded threes. Marcin Sroka benefitted from a second-chance basket. 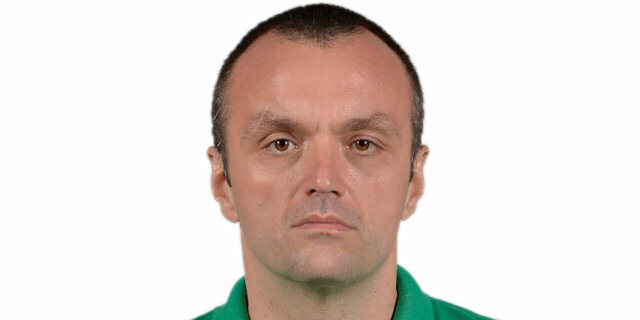 Zielona Gora lost an important weapon when Dragicevic was called for a third foul. Nonetheless, Koszarek buried a jumper to make it 29-22 midway through the quarter. Macvan reached 10 individual points and Erceg added free throws as the hosts rebuilt their double-digit lead. Cel scored in the paint, but layups by Macvan and Huseyin Koksal saw the hosts start to pull away. Macvan capped a 10-2 run with free throws to make it 39-24. Cel sank a jumper for Zielona Gora and Craig Brackins finished a fast break with an uncontested slam. Ender Arslan left the court after getting poked in the eye. Koszarek free throws made it 41-30 at the break. 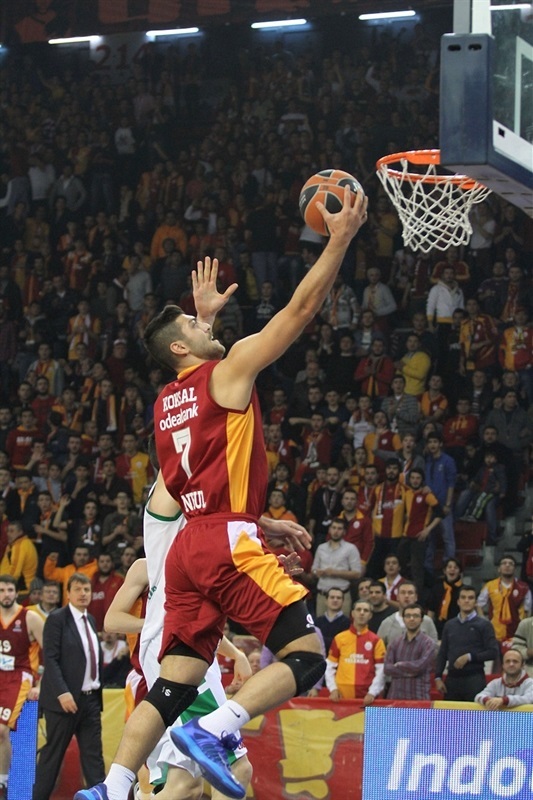 Arslan was back for the second half and made an instant impact by leading Aldemir for a fast break slam. Erceg added a basket as the hosts kept Zielona Gora without points for four minutes until Christian Eyenga sank a jumper. Aldemir stuffed an Arslan miss back in to make it 47-32. Brackins and Przemyslaw Zamojski drained threes, but Aldemir continued to control the paint after his layup attempt was counted through a goaltending call on Eyenga. Brackins drew the visitors within 11, but Akyol’s third three of the night followed by a pair of Erceg scores boosted the margin to 58-40. Zamojski assisted Brackins for a slam and Zamojski connected from downtown. An Erceg three-point play and Erving Walker layup left the hosts in charge, 61-47, through three quarters. Hrycaniuk corrected his own miss. Arroyo set up Macvan for an easy bucket. Erving’s layup was matched by Arroyo from the line. 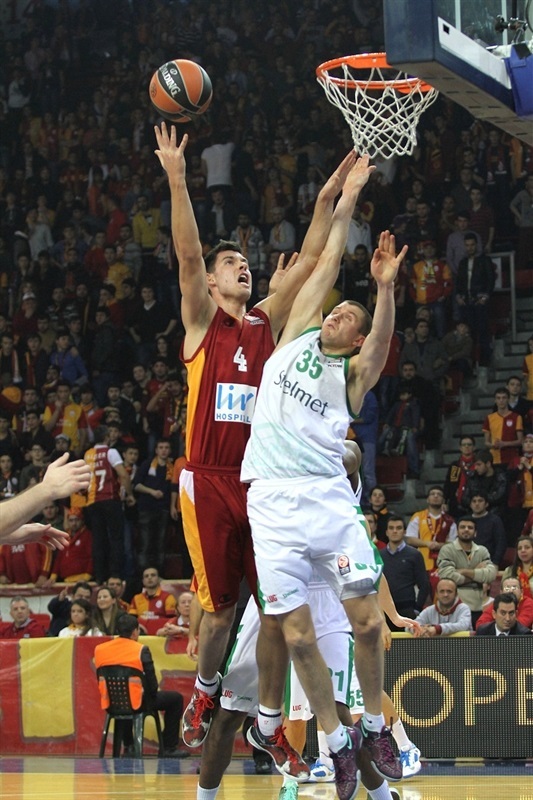 Koszarek tried to ignite the visitors with a mid-range jumper, however another Aldemir rebound led to a Macvan layup and a 15-point Galatasaray lead midway through the quarter. Sinan Guler got on the scoreboard after converting free throws – the result of an unsportsmanlike foul call on Koszarek. 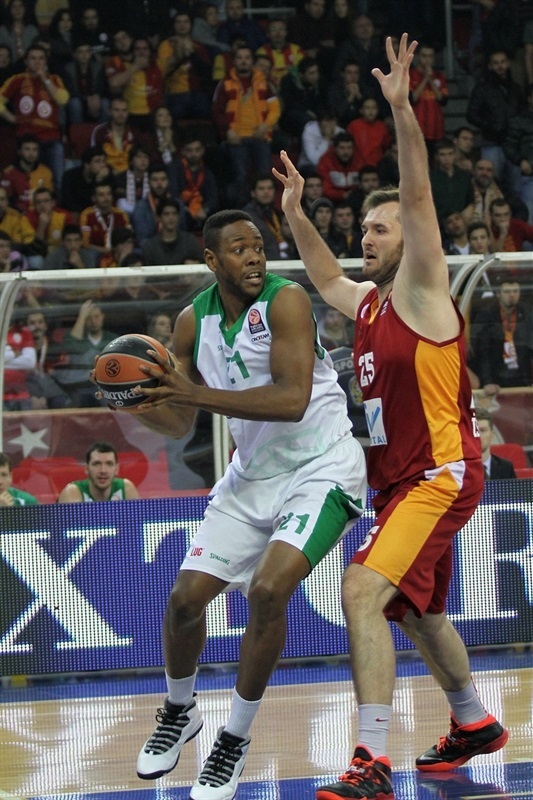 The defenses went away in the final minutes with the outcome clear as Galatasaray marched to victory. "I congratulate my players. Even though we guaranteed reaching the Top 16, my team came to win second place. I also want to thank our fans. From the beginning we played good defense. On offense, our scorers Carlos and Ender didn’t score too much, but they led our offense very well. Furkan had a very good day. Erceg was effective in the second half, whereas Macvan was in the first. We played good as a team. It’s a good win for us. It motivates us for the Top 16." "First of all, I want to congratulate Galatasaray Liv Hospital. We were down after the first quarter because of our player's foul trouble and low shooting percentage. 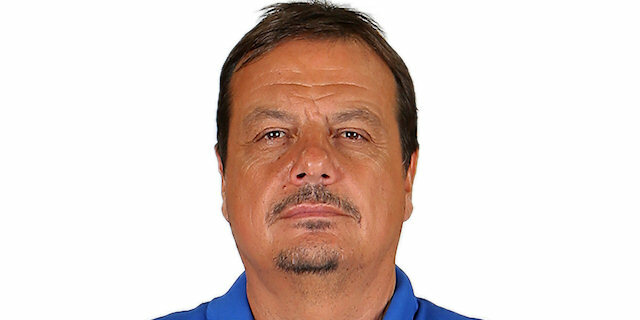 I congratulate Galatasaray and their head coach Ergin Ataman. I wish the best for them in the Top 16."